* Taste this original traditional Japanese style udon with the exceptionally soft but chewy noodle made only by Hanil Food method and broth made from bonito extract, anchovy, and kelp. 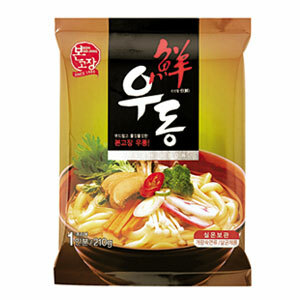 Deuchi Udon is one of the representative products of Hanil Food and is well known for its savory and refreshing soup as well as chewy and soft texture of the noodle. It consists of premium noodle, the Deuchi noodle, (Handmade-like noodle), liquid soup base, and dried flakes. Liquid soup made of extracts from bonito, anchovy, and kelp extract enhance the udon's taste even further. Add other toppings to make the udon tastier. * The true taste of udon is brought alive with the fresh and clean bonito broth. * This noodle dish is the simplest of the Korean Udon dishes. It consists of noodle, powder soup base, and dried flakes. The noodle is cooked and served in the bonito based soup with the dried flakes. This is one of the most economical udon dishes among the Hanil Food products.